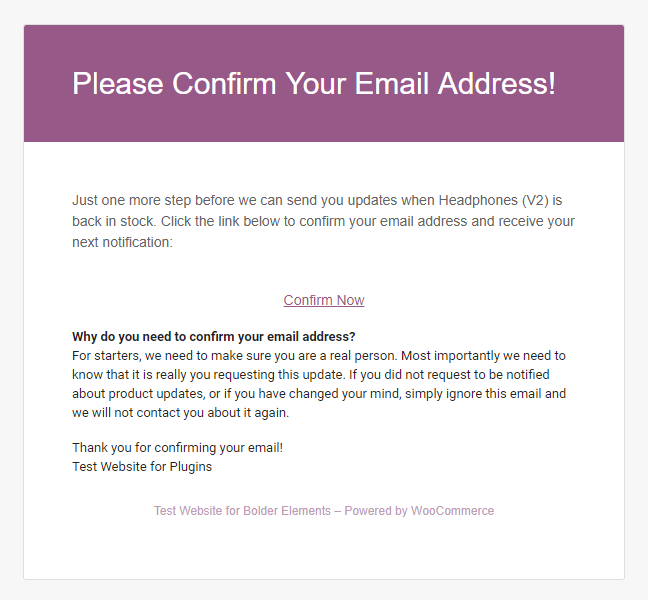 More exciting changes have arrived for the Product Alerts for WooCommerce plugin! The focus for this update went primarily to GDPR after it was activated earlier this year. Being that this is an email marketing plugin, it was important that compliance as added for new users as well as existing registrations. In addition to the new privacy options, several smaller features were added as well based on popular request. 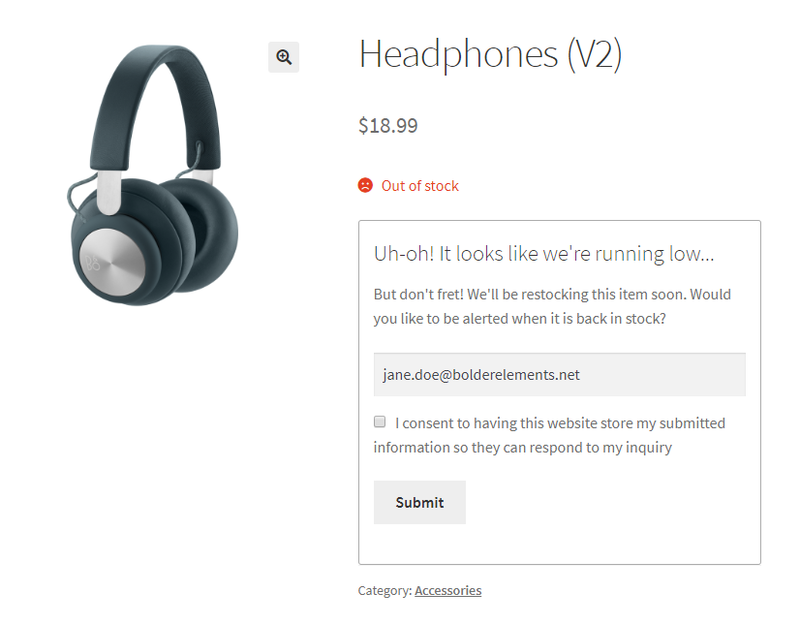 A few bug fixes were also added to address changes in recent WooCommerce updates. Due to the new privacy regulations on certain email alerts, this plugin will require a database update before it continue to operate successfully. After updating, please visit the dashboard and follow the prompt at the top of the page to complete the update. When enabled, the above checkbox will appear with a message that you setup. The form will not be submitted unless that box is checked. An email alert will also not be sent to any registered email address that has not consented. Any address registered before this feature was enabled will be affected. Fear not! When a user visits their account to review their subscriptions, they will see a warning message prompting them to accept the terms. Another common concern was the ability for any visitor to register any email address. It is difficult to maintain privacy when the actual user them self may have not been the one to signup. The Double Opt-In feature was created for just this purpose. When enabled, the visitor will need a second method of proof to be considered a valid registration. This can be met by the user logging in beforehand as a password is proof of identity. For unregistered visitors, this requirement can be met with an email authentication. After signing up, they will receive an email asking them to confirm that they wish for an email alert to be sent to them. Without confirming this, a restocking alert will not be sent. The development servers for plugins at Bolder Elements run very lean. This means that we have a simple theme and as few plugins as possible activated at one time. This is of course not the situation for most shop owners. In order to fully customize your shop’s experience, more plugins are necessary, and sometimes they take up a lot of space. There’s no hiding the fact that the restocking alert form can get quite long, especially if you have the CAPTCHA enabled. 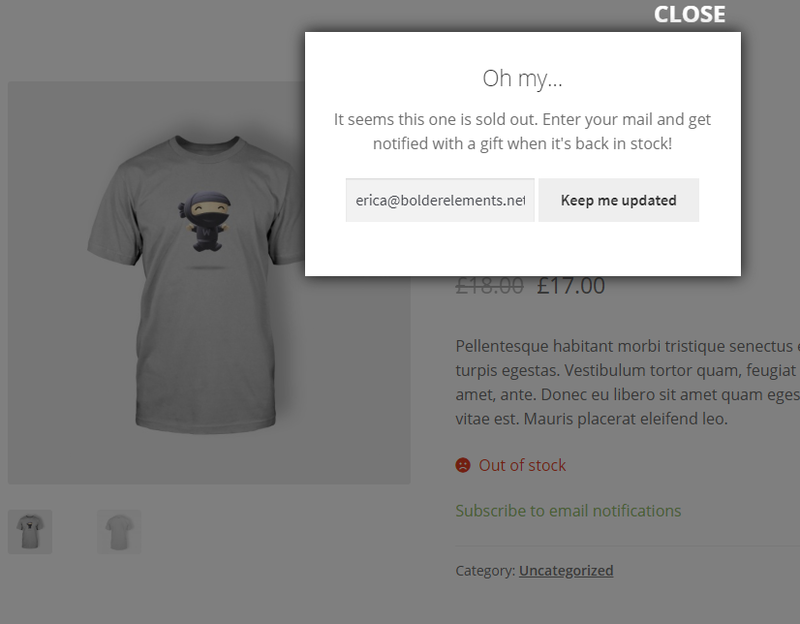 To resolve this dilemma, the form can now be shown in a popup rather than displayed at length on the page. A simple hyperlink will be shown, and when clicked, the form as you know it will appear in a small popup overlay. The hope is that this update will help resolve a lot of issues or clarity requests made over the last year. Unfortunately, several enhancements had to be pushed off to a later version in order to address GDPR concerns sooner. If you have any concerns about the GDPR compatibility please do not be too shy to open a ticket on the support website and let us know! GDPR is still very new and we are all still learning exactly what the limitations and requirements are. We are always happy to consider any feedback regarding this or any of the plugin’s functionality. DISCLAIMER: This article is aimed to help shop owners configure new settings that are related to the new GDPR laws in Europe to the best of our knowledge. It is in no way official legal advice or a guarantee that you will be fully compliant after configuration. We strongly recommend speaking with a lawyer or a privacy law expert to ensure you are fully compliant.